In “brick and mortar” stores, we rely on product design and packaging, product placement such as shelf locations or end caps, and discount signs to help draw shoppers’ eyes to special deals or items we want them to see. In online shopping, we use different techniques and features to create an equivalent merchandising experience that helps visitors identify brands, sales or seasonal promotions and essentially, draws more eyes to products. Online merchandising allows retailers to adjust the display of their inventory with the click of a button. There are many different ways to create powerful merchandising, and I would like to highlight three primary steps – tuning, merchandising banners and reports – which can add significant value to your eCommerce efforts. In SLI’s merchandising console, we have created tuning rules that are designed to help promote or demote specific products as the merchandiser sees fit. This works in conjunction with our learning search and navigation, which naturally surfaces the most popular products over time. Learning search works remarkably well in increasing conversions because it adapts to what you visitors want. However sometimes you may want to override that. For example, a product may be new or you may want to promote it because of better margins, excess stock, or to coordinate with other promotional activity. In cases like this, merchandisers can create a “tuning rule” that places certain products at the top of the search results or navigation page. They can also push certain products, such as out-of-stock or seasonal products to the bottom of, or completely off of the results set. Another useful merchandising tool is the banner. Banners can be shown anywhere on the search or navigation page and can be triggered by a number of different rules. For example the banner could contain logos and other imagery associated with the keyword or facet. If someone searches for a TV or clicks on the TV category you could show a banner that displays a TV selection widget. Banners can be used when people search for products that you don’t carry, with the banner promoting alternative products. Many of our customers use a combination of banners and tunings to create landing pages for advertising campaigns. They select a keyword that is unique to the campaign, write a rule to show a banner with graphics associated with campaign and then use tunings to select products to show on the page. This allows marketers to quickly and easily create arbitrary landing pages. 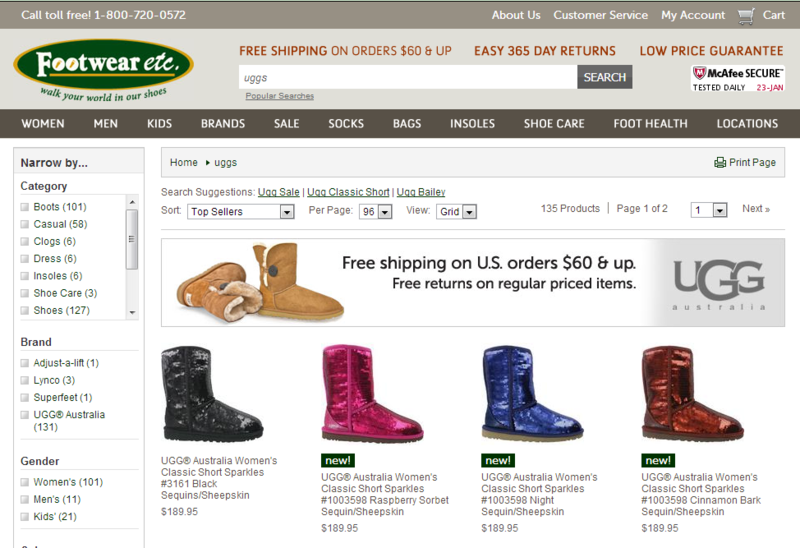 The screenshot below shows a simple merchandising banner promoting free shipping for all UGG boots that displays when searching for UGG boots. 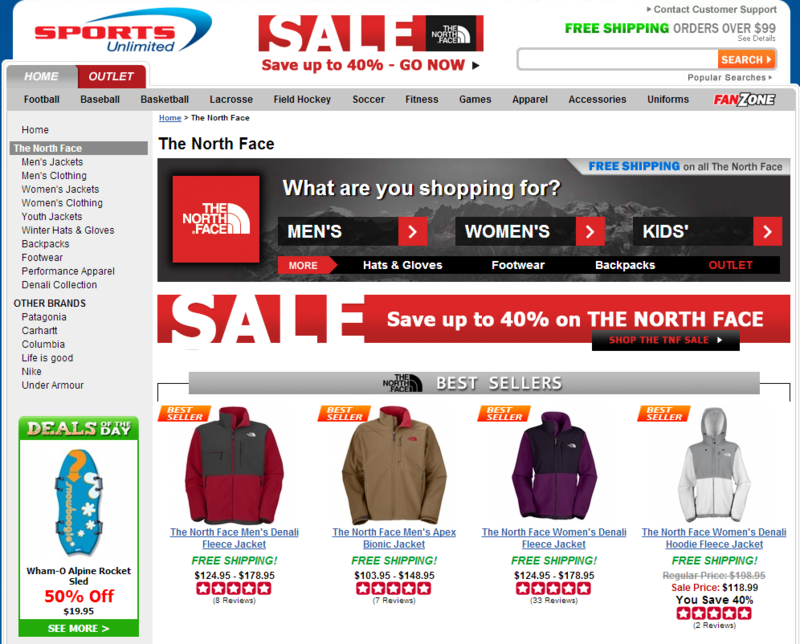 The screenshot below shows a merchandising banner on a search page that advertises North Face products, with clickable links to refine search pages by gender, age and more. But what good are these tools if you don’t even know what your customers want? Our reporting allows merchandisers to easily access key data about customers’ search behavior. The Top Searches report can give useful insights about the most popular keyword searches, showing you the language that your customers use and identifying some possible candidates for fine tuning or adding banners. Conversely, merchandisers can view reports that show search phrases with poor results to identify phrases that are being searched but have low click-through rates. This may indicate that your customers are using different language to describe your products than you do, or it could give you clues about products that you don’t carry, that your visitors expect to find.